Sepia ink on bristol vellum (140 lb. ), 4 x 6 inches. Will add watercolor to finish later. Hoping to do overall sepia tone washes with spots of soft colors for a dream-like feel. 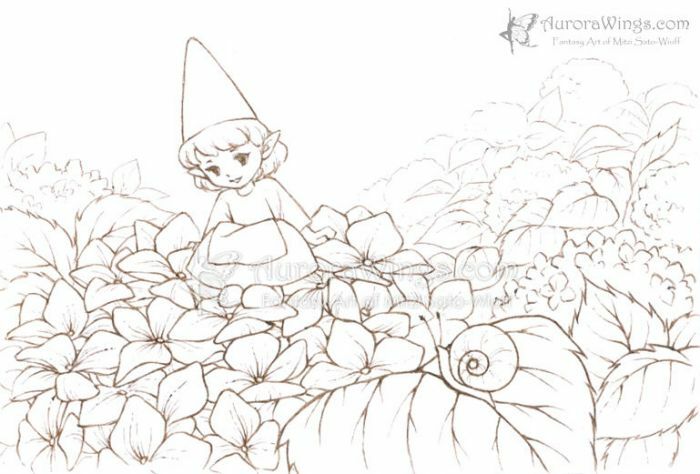 A tiny young gnome (or my original character, Little Tomte) sits on a flower cluster in a hydrangea garden. Her little friend, baby snail is coming to see her. Evelyn Henderson says: Adorable. One of my favorite flowers...	~ Reply?